The first horse in the Stats Accumulator with Sky Bet comes from Hereford in the Class 4 Novices Hurdle contest over 2 miles and we have selected the Phillip Hobbs trained Precious Bounty. This four year old has only raced three times in his career and his best form comes from an Irish point race at Dawstown where he came a good second out of 12 runners. Phillip Hobbs is in electric form at the moment posing a strike rate of 30 percent over the last 14 days. With this, Hobbs has a great record at this track with 33.33 percent of his runners going on to win, this is similar for the Champion Jockey Richard Johnson that when riding at Hereford he has a strike rate of 28 percent. 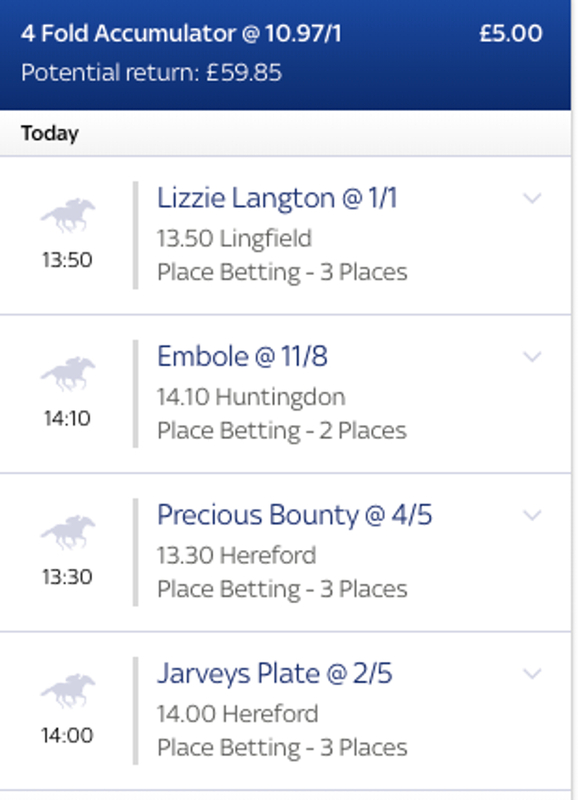 The second horse of the bet comes from Lingfield over the jumps in the Class 4 Novice Handicap Chase over 2 mile 4 furlongs and we have selected Lizzie Langton to go on and finish in the top three. This Colin Tizzard trained seven year old has had an up and own career to date but has had a wind operation recently and this might spark a revival for the mare. Tizzard is in great form at the moment having a five timer on Sunday and giving him a strike rate of 22.22 percent over the last 14 days. Harry Cobden is in the saddle today and has a fine record at this track with a 40 percent strike rate for his rides here. The penultimate horse of the bet comes from Hereford again in the Class 4 Novice Hurdle over 2 miles and we have gone for the Fergal O'Brien trained Jarveys Plate to place. 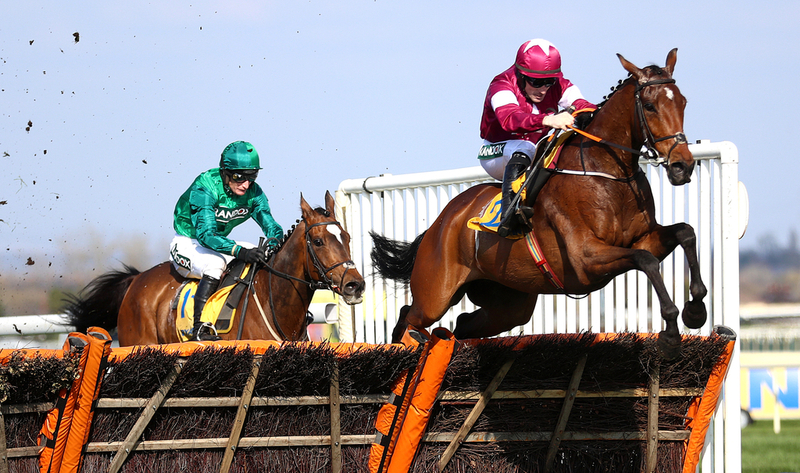 This five year old won in really good style on his only bumper start and now stepping up for his hurdles debut he could be the one to beat if repeating that form. Fergal O'Brien has been in some decent form in the last two weeks having a strike rate of 25 percent for the past two weeks. This is similar for the jockey in the saddle today Paddy Brennan who is riding at a 19 percent strike rate for his runners over the last 14 days. The final selection of the Stats Accumulator with Sky Bet comes from Huntingdon in the Class 2 handicap hurdle over 2 miles and we have gone with Embole trained by Dan Skelton to place. This four year old is very unexposed for his age and on his final outing of last season he finished a good third at Ayr, showing that if going well fresh can be a real talent this season. Harry Skelton is in the saddle for his brother today and he has a strike rate of 22 percent for the past 14 days of riding and with this him and his brother are running at 22.43 percent when teaming up together each year.